In October 2014, the EU launched its Macro-Regional Strategy for the Adriatic-Ionian area, EUSAIR. One year later, OBC and CeSPI analysed its first steps, challenges and opportunities, in the frame of the project “The Adriatic-Ionian macro-region: a hurdle process. The start of the Adriatic-Ionian Regional Strategy in the perspective of Italian foreign policy and the European integration of the Western Balkans”, funded by the Italian Ministry of Foreign Affairs and International Cooperation (MAECI). 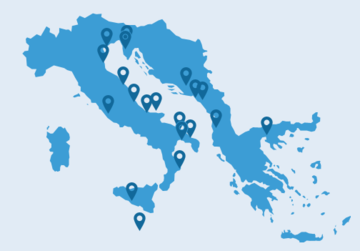 Started in October 2014 in the context of the territorial cohesion policy of the European Union, EUSAIR is a multilevel governance tool matching partners who share the challenges and opportunities of the Adriatic region. The strategy links the internal and external dimension of European policies, by involving 4 EU member states, 2 candidate countries (Serbia, Montenegro) and 2 potential candidate countries (Bosnia and Herzegovina, Macedonia). EUSAIR hence assumes particular significance in the context of integration policies, stimulating the deepening of the European ties in view of future enlargement. A year after the launch of the strategy, this analysis considers the governance challenges that the EUSAIR faces, by focusing in particular on potential obstacles to its effectiveness and sustainability. A case study is included assessing how EUSAIR has been covered by the Croatian media. Policy recommendations are included, drawing on the problems identified in the analysis. The analysis takes stock of the relationship between the Macro-Regional Strategy and other multilateral initiatives such as the Berlin Process, highlighting the specificity of their respective approaches: the inter-governmental character of the Berlin process is presented as necessarily complementary to the multi-level and multi-stakeholder governance promoted through EUSAIR. In order to guarantee the participation of the different levels of government and of the social and economic actors, the Strategy will have to succeed in involving local authorities and stakeholders in the Balkan countries, which so far have demonstrated the weakest degree of participation. In this sense, the ADRION transnational program plays a central role through the stakeholder platform, a tool which should be implemented as soon as possible and in a subsidiary manner. The examination of media coverage in Croatia shows that EUSAIR is still widely unknown to the public opinion. The dialogue between political-administrative apparatuses must be accompanied and supported by a broad debate in the transnational public sphere in order to develop the full potential of EUSAIR. Namely, the involvement of the public sphere is needed to integrate a bottom-up approach. In this regard, the communication effort should be designed not simplistically as a requirement of visibility, but as an investment for increasing the awareness and citizens' participation in the construction of the Adriatic-Ionic common good. The case study on Croatia, moreover, highlights the persistence of national and local interests and bilateral disputes that prevent the development of a transnational regional-oriented perspective of general and common interests. EUSAIR can contribute overcoming this approach by stimulating the creation of a transnational, multi-level system of government (polity), and by producing concrete lines of action (policy). As a strategy supporting Europeanization, EUSAIR is an opportunity to revive the idea of a cohesive and open European Union; at the same time, and in combination with the Berlin process, it can play a crucial role in keeping alive the prospect of accession of the Western Balkans. Not least, EUSAIR represents a tool for regional dialogue, to counter the divisive and centrifugal forces exacerbated by the crisis. The analysis was conducted by OBC and CeSPI in the frame of the project “The Adriatic-Ionian macro-region: a hurdle process. The start of the Adriatic-Ionian Regional Strategy in the perspective of Italian foreign policy and the European integration of the Western Balkans”.